Politicians campaigning one way then governing differently are as American as Mom and apple pie. Case in point: Kansas Governor-elect Laura Kelly. “Candidate Kelly” projected the image of a reasonable, reach-across-the-aisle moderate, talking up issues like school funding, health care and the economy. Once safely elected, the narrative changed. During Kelly’s first post-election news conference, she prompted statewide headlines with the astonishing statement that she’d direct her staff to not follow the law. Her target: the new Kansas Adoption Protection Act (APA). As the Kansas Catholic Church’s top legislative priority in 2018, the APA’s focus is simple and reasonable. Faith-based adoption agencies like Catholic Charities should be protected to place children in homes with a married mother and father. This basic exercise of Catholic religious freedom draws on two millennia of church teaching, Sacred Scripture and the model of the Holy Family. It’s hardly controversial. The governor-elect claims the APA somehow discriminates against “gay couples.” She’s also fully aware Kansas law allows other agencies to make such child placements — which they do on a regular basis. The APA protects religious freedom. It also protects mothers in crisis who want the best for infants they bravely choose to bring into the world. But the governor-elect’s ideology trumps the welfare of moms and their children. This is one front in a larger cultural struggle. 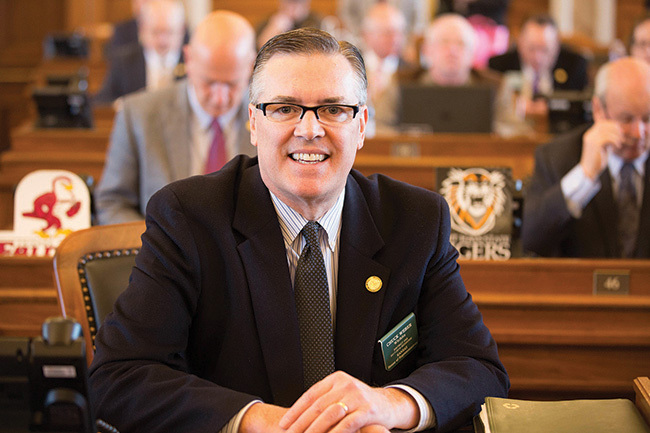 Few Kansans know that an average of one to two unborn babies are being dismembered and aborted alive each and every day in Kansas. Governor-elect Kelly supports this assault on innocent human life. Our faith, values and cherished way of life are under attack. A new reality is being imposed on faithful Catholics. If we don’t believe what they believe and if we don’t act like they act, we’re bigots, plain and simple. So what to do? Despair and apathy are not options. We will seek common ground with Governor-elect Kelly and others. Quality health care, concern for the poor, and greater educational choice and opportunity are goals we can all agree upon. We can also pray, like never before. This is first and foremost a spiritual struggle. Prayer is our most powerful response. We have special Catholic gifts at our fingertips like daily Mass, the rosary and adoration of the Blessed Sacrament. Let’s use them. Be informed. The Kansas Catholic Conference is soon launching a new website at: www.kansas catholic.org. Stay up-to-date by accessing our Facebook page at: www.facebook.com/kscathconf. Sign up for legislative updates. Be involved. Do you know your state senator and representative? Call or send them a letter or email. Let them know you care. Be respectful, but persistent.